Teaching is more than just the delivery of knowledge, as every teacher knows. Chemistry teachers instruct children in secondary education schools all over the country. They must teach theory as well as practical uses of world. Though the main job of a chemistry teacher is to teach chemistry, the actual job may involve a lot more than that. Many teachers not only teach the subject, but also conduct research into their chosen fields. 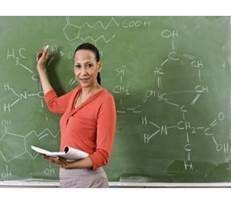 In order to teach most effectively a chemistry teacher develops lesson plans, which not only include lectures and homework, but also labs and demonstrations. Based on the information presented in class, along with the information presented in the directed readings, the teacher creates tests to make sure the students are properly learning the material. Typically, teachers spend 40 to 50 percent of their time in the classroom actually teaching. While this may make it seem like teachers have a great deal of free time on their hands, other duties often keep them very busy. The rest of the time is spent in devising lesson plans, holding classes, grading papers and other assigned duties. To become a chemistry teacher, the prospective candidate not only needs to take a variety of sciences, and specifically chemistry, classes as part of the university curriculum, but the teacher-to-be also must meet his/her state's teaching requirements. Each country has its own teacher certification requirements but in general the rules are very much the same. There is a specific listing of courses required for chemistry education majors with a special emphasis on the methods of teaching the subject as well as the foundations of psychology and pedagogics. The prospective teachers should also acquire some practical skills and experience during their training at school as part of the curriculum. There is a world-wide shortage of chemistry teachers. It is hard to keep science teachers. Many young specialists leave schools after the compulsory three years of work according to the state legislation. This is because people with science training can get jobs that pay more outside of teaching. There are some ways to solve the problem. The state should offer better salaries, improve teachers’ working conditions, and provide teachers with more mentoring. There’s also a strong need for a funding system that gives extra support to teachers who choose to work in hard-to-staff schools.